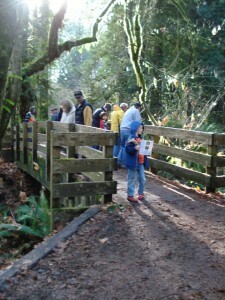 This weekend brought unusual and much welcomed sunshine to the Kennedy Creek Trail. We enjoyed nearly 500 inquisitive and excited visitors on Saturday alone. We even had the pleasure of welcoming visitors from the Seattle area, who read about the trail in this recent Seattle Times article. The latest update from the Squaxin Island Tribe revealed that as of last week 12,000 chum were estimated to have traveled into Kennedy Creek since the beginning of the month. This year, the target number for escapement is 14, 050. For a good overview on the importance of escapement numbers, click here. Here is information about how escapement is determined locally, as well as actual escapement numbers, from the WA Dept of Fish and Wildlife. Since two weeks ago, when I last blogged, Fiscus Creek has come alive with chum. 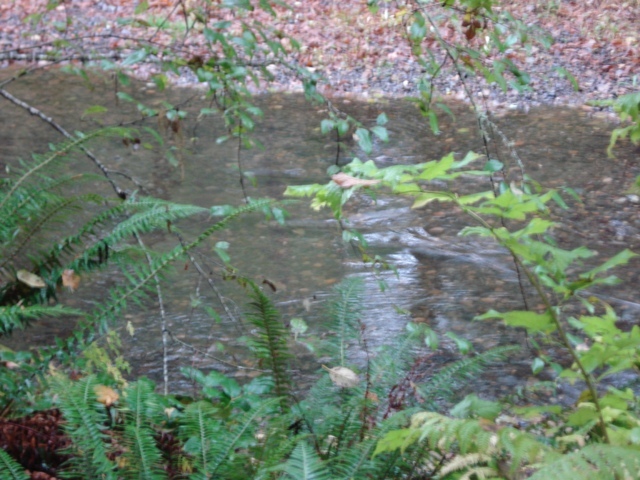 It became the focal point of the weekend since flows turbid from recent rain events made viewing difficult in Kennedy Creek. 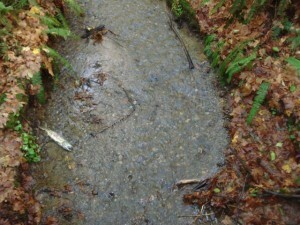 Instead of freshly fallen leaves there were dead salmon strewn about the creek bed. At this point, in Fiscus Creek, live fish outnumbered the dead (which could be due in part to the high flow events of the past week). I expect that the carcasses will far outnumber the live fish by the end of the month. Though not much spawning activity seemed to be going on overall, there was one pair that kept at it all day long. I have video footage of their spawning behavior, which it appears is too large to upload to the site, I’ll have to see if that can’t be changed. Station 3, though certainly not as exciting as Fiscus Creek, was a different place from the beginning of the month when flows did not reach bankfull width, and the water was clear enough to see salmon in the main channel. 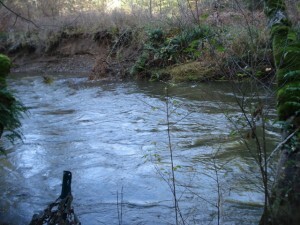 Now high flows have engulfed the stream bed and created turbidity, making viewing difficult. 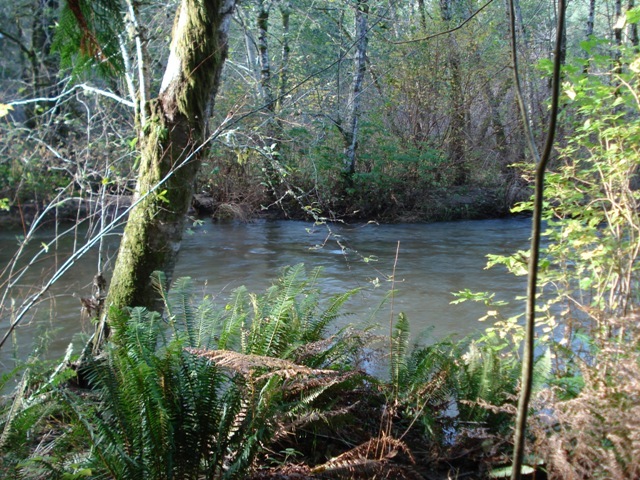 However, these high flows have activated off channel habitat, crucial for the survival of the juvenile and adult life stages of salmon. 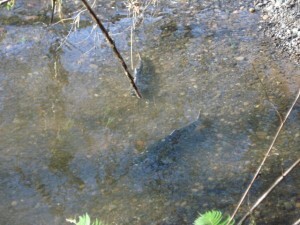 The photo below shows an activated side pool, where the chum took refuge to conserve energy. Stations 8/9 were also different from the beginning of the season. 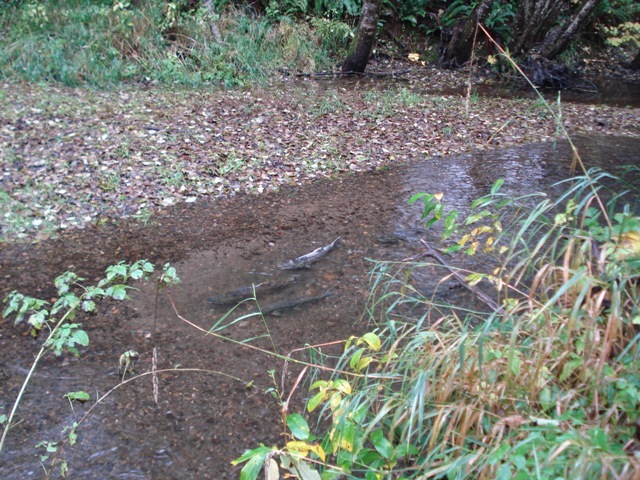 While this photo was taken from a slightly different vantage point it is possible to see that the gravel bar, covered with leaves and other material, is completely engulfed by the water. The freshet, or flood, produced by last week’s rain events seems to have cleared out carcasses, and there did not seem to be as many salmon present in general. 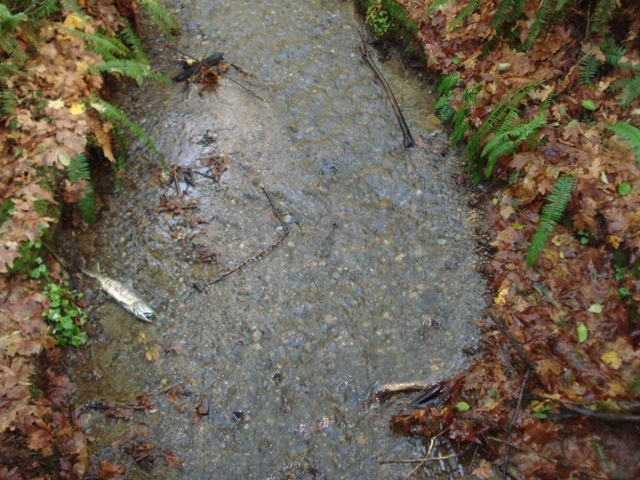 Spring and fall freshets are a factor that heavily influences the start of salmon migration, whether it is for juvenile salmon to head out to the estuary in the spring, or in this case, for adults to begin the migration upstream. It is likely that this fall freshet will induce another wave of migration up the creek. Another thing of notewas the smell of rotting carcasses. While the smell was not all-pervasive, it had changed from the clean, fresh air of the beginning of the season. On a personal note, it can be really hard to watch all of this death happening before your eyes (my eyes), and it can be sad at times. But it is worth taking the time to consider that these fish live to die. The fact that they even make it back to their natal ground is amazing, and when they spawn and die they have fulfilled their life’s meaning. For more details about the sights and sounds of this weekend, please see my photo journal. Well, that concludes this week’s news. 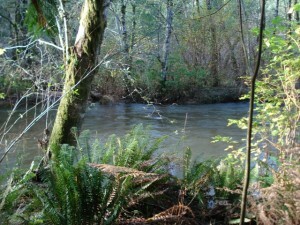 There are still two weeks to catch the salmon at the trail, I hope to see you out there!